ACF: We’re here at Falkland in Scotland where you’re engaged in a sound project. Would you describe that? 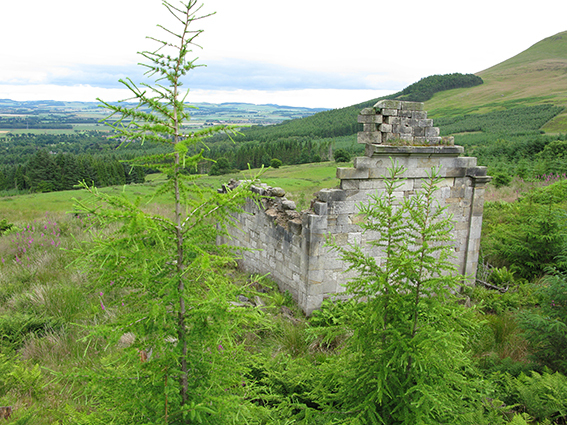 DC & LKW: Our collaborative sound art project is focused on the Falkland Estate in Fife, Scotland (to the north of Edinburgh) and has been slowly evolving following a series of visits over the last year, primarily funded by a research and development grant from the Calouste Gulbenkian Foundation. We are looking to complete the physical production and temporary installation of works on the Estate by the end of next year and will follow that with a publication exploring the processes and ideas behind these pieces, hopefully with contributions from a range of writers. Some brief background, the Estate (comprising about 4,600 acres of mixed woodland, moorland and agricultural land) was originally established as a Royal Hunting Park in the mid-fifteenth century and was a preserve of the Stuart kings up until the seventeenth century. The Royal Palace of Falkland was the country residence and hunting lodge of eight Stuart monarchs, including Mary, Queen of Scots. Following a period of neglect, some extensive development was carried out in the nineteenth century under the auspices of Onesiphorus Tyndall-Bruce and his wife, Margaret Bruce – with the significant landscaping of the gardens and House of Falkland (built 1838-44) and the construction of a number of temples and monuments. Falkland Centre for Stewardship now looks after some 120 acres at the heart of the Estate and, beside its more usual responsibilities, is interested in adding new layers of art to the historical designed and “sublime” landscape – especially to help reveal and deepen understanding of the special qualities of this place. 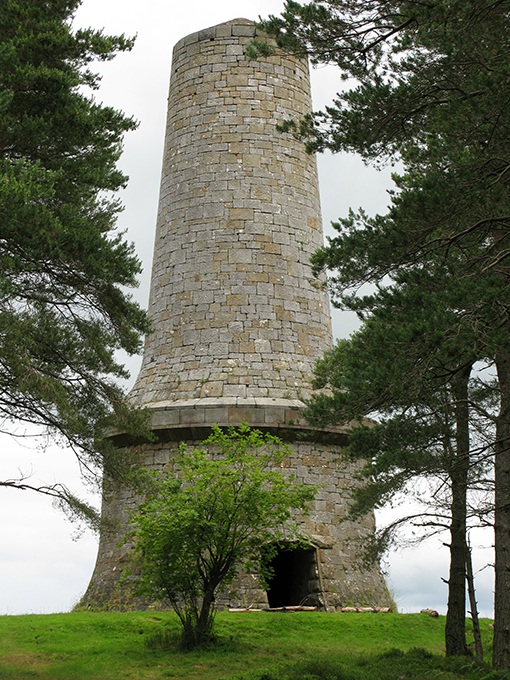 Our involvement with the Centre has stemmed from conversations around the creation of temporary sound (and visual) artworks that would primarily respond to Falkland’s unique geological and archaeological features and historical narratives. The sound from the Estate is the basic starting-point for any of the sound design work. The point of being here is to see how we might explore and understand the estate in terms of its sonic properties. In this regard, we refer back to Murray Schaffer’s ideas of the ‘soundscape’ and ‘soundmarks’ – the unique and distinguishing sonic qualities of a place. However, we also want to take this further. While we use the sound we find in situ as a starting point, we may want to extrapolate from that in some way – as with the reconstructive acoustics of the Temple of Decision folly (discussed further below) or, by using specific equipment like hydrophones or bat detectors, to find sounds which are not there – in the straightforward sense of being audible under normal conditions. In addition, it’s about exploring what qualities a specific space might offer once it’s ‘excited’ – such as the Bruce Monument (image 2) or the Real Tennis court in the Palace. Areas we might ‘activate’ in a performative sense, to create sonic experiences that would not normally occur. Using the acoustics of a place to shape other material we might want to bring into that space. Though we might also include live sound making of some kind or a technological ‘wiring’ of the space. Our collaboration is firstly prompted by a shared interest and experience of using field recording in various environments, employing an array of familiar and unusual recording techniques (such as hydrophones, binaural microphones, ultrasonic detectors and so on) as a means to go beyond the audible and immediately recognizable ‘signature’ of a place. We’re also interested in post-production manipulation and ‘treating’ of this recorded material by, for example, exploring space through the modeling of (convolution) reverb and the use of granular synthesis. Coupled with this is an interest in the current use of specific tools and techniques that may poetically and scientifically quantify acoustic space. As such, this project continues critical and aesthetic ideas that we have undertaken individually – such as Louise’s ongoing pieces exploring the relationship between acoustics and memory at Cold War sites in the UK and abroad, and David’s work investigating the sonic mediation of the natural world and durational exploration of place and environment through audio-visual installation. 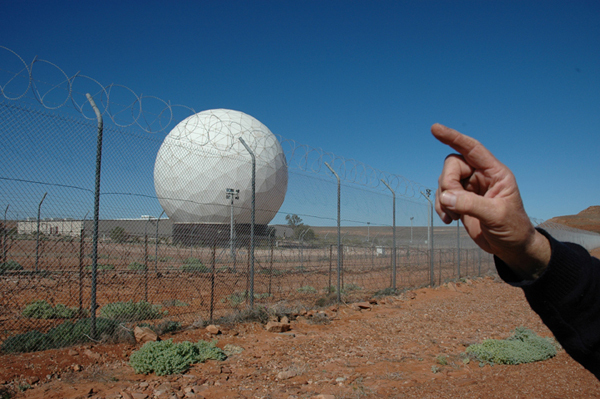 Louise’s recent work has been informed by a desire to enter and make recordings inside closed and difficult to access Cold War sites, whether abandoned or still active in other ways. In 2005 for example she was able to negotiate entry to AWE (Atomic Weapon Establishment) Aldermaston in the UK in order to make an audio recording of a working centrifuge, formerly in use at AWRE Orfordness (where she was producing a series of sound installations). She was interested to note that visitors to Aldermaston are not allowed to take photographs or make sketches on-site but sounds are evidently more benign and can ‘escape’. Of particular interest to her is the presence of reflected sound (like echoes and reverberations), which is more pronounced in the absence of machinery, people and so on. She has been accumulating an archive of convolution reverb samples of Cold War sites; these are, in a sense, archaeological artifacts. The acoustic signature of a space has partially been captured and archived and is now able to ‘carry’ other voices and sounds. David’s background is in music and documentary film. His recent work has focussed on the durational exploration of place and environment through sound and audio-visual installation. This has involved the creation of soundscapes and compositions that are based on field recordings and archive material. Since 2003 much of this work has centred on the Lee Valley, northeast of London, and specifically through a relationship with the Gunpowder Park. The Park has evolved from an abandoned munitions test site to a managed public green space with a remit for developing arts projects that engage with nature and the environment. This relationship has sparked a number of commissioned works for gallery, radio and the Internet, Culminating in Hark (2005), and a further iteration Hark 2 (2007). To describe Hark (2005) briefly:it is a collaborative audio-visual installation, the sound element based on his field recordings made in and around Gunpowder Park and the Lee Valley. These recordings are used as the source material for the composition of a number of soundscapes, shaped through digital processing and presented via 5:1 surround-sound. 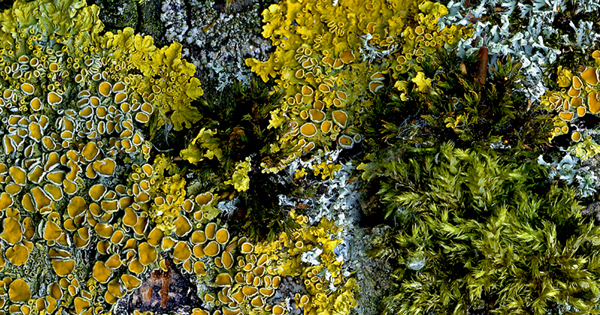 The visual element of the project, produced by leading natural history photographer David Cottridge, explores the texture, colour and grain of tree bark, lichens and mosses through large-scale macroscopic photographs recorded on the same site. 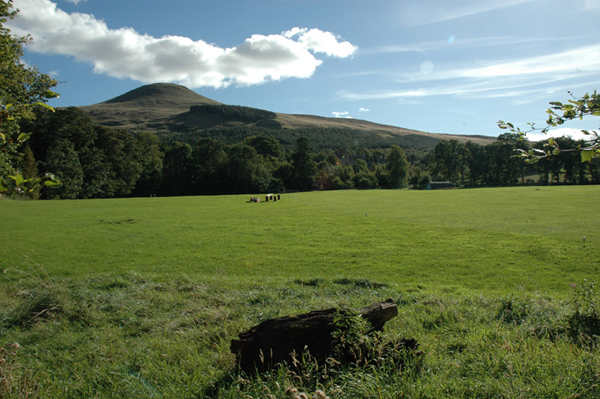 Our current research at Falkland is towards the production of a pre-recorded soundwalk, intended to lead the participant on a journey through the varied terrain of the Estate. This composition will combine extracts of speech and song with treated field recordings. At its core is the notion of the ‘filters’ through which various people view and listen to the Estate, which are informed by their specific experiences, preconceptions and knowledge. As a starting point we have been undertaking walks and recorded interviews with people who already have an interest in the estate. So far these have included: John Fletcher, a local deer farmer, vet and deer historian, who has taken an active interest in the recent find of a small copper alloy stag’s head on the Estate; David Jones (an art historian at the University of St Andrews) who has a wide ranging knowledge and interest in the architecture and design history of the Estate and who addresses the flows of water at Falkland, and Stuart Haszeldine, a Professor of Sedimentary Geology at Edinburgh, who describes the geological make-up of Maspie Den. The soundwalk, if not an entirely new idea, is appropriate as it is an adjunct to how most visitors access and use the Estate. It also fits the need to develop work that has longevity, in that it can be accessed for a number of years, The piece will be available as an mp3 download because of its properties as a popular technology that has minimal physical impact on the environment. The soundwalk is to be designed to create interaction with the real sounds in the environment – creating complex interaction. This may be seen as an enhancement rather than an exclusion of the existing soundscape, which may consciously play with what the participant might hear in the environment and what they will hear on the headphones. This will lead on to the production of large-scale distributed sound works at Falkland in late 2009. Our ideas here include the production of a video piece about the reconstructive acoustics project centering on the ruined Temple of Decision (a folly built by the Tyndale Bruces during the 19th century renovations) and a work filtering the sounds of the burns (streams) to produce pure sine waves of different flows (which may then be ‘sung’ by a choir). ACF: Would you say some more about the reconstructive acoustics project focused on the Temple of Decision? What are your aims with this? And what purpose do you think this kind of activity (sonic reconstruction) can have? Is it equivalent to visual reconstruction? DC & LKW: Specifically, we’ve been looking to employ or apply reconstructive acoustic archaeology to recent historical structures as well as ancient and pre-historical remains on the Estate. In particular we are interested in the process and the will to create a simulation of the past acoustic of the Temple of Decision. The Temple (built 1850-56) is situated on Green Hill and was designed by Alexander Roos as a key focal point and promontory for viewing the Estate. Its ruined condition prompted our curiosity about the sounds of lived space and of spaces out of oral history range. We are addressing the technique of ‘convolution reverb’ to colour other sounds simulating the experience of listening inside the Temple when the building was intact. To that end, we’ve enlisted the help of Dr Damian Murphy (a composer and virtual acoustics researcher at the University of York) who has been involved in virtual acoustics projects – modelling the acoustics of ruined Cistercian churches for example and the bombed remains of Coventry Cathedral, to embed contemporary voices in the acoustic of its Medieval heyday. The impetus behind Damian’s previous projects has in part been in ‘hearing the past’ when exploring the intrinsic link between space and performance. These concerns provide much poetic and critical conjecture. The use of sonic reconstruction in our project is not equivalent to visual reconstruction since the intention when creating the convolution reverb is that it acts as a ‘carrier’. Although we hope the creation of this reverb is as ‘accurate’ as it can be in the paucity of information we have managed to gather (architectural plans and so on) we are allowing ourselves freedom to potentially feed other sounds through this reverb that would not have been extant when the Temple was intact. ACF: The relationship between sound and space is a vital one. Can you talk about how this functions in your work and what it means for you? Do you have any sense of how you might work with this at Falkland? DC & LKW: The intrinsic relationship between sound and space is one we are contemplating and have been exploring in a number of different ways. Fundamentally we are dealing with a site with a rich architectural and social history, so the question of how this is embedded in the place is key – as well as the means to make motivating narratives audible – and visible. An obvious example is the Temple piece just discussed since the acoustic signature of a place is inherently ‘about’ the age-old connection between sound and space. To pull out two strands here for consideration: firstly, we have an interest in the close relationship between sound and interiority, linking architectural with bodily spaces, which is perhaps key to understanding such sites. We are continually returning to notions of ‘sounding out’ and ‘re-voicing’ physical spaces and places as a means to introduce notions of friction, analysis and poetic intervention. Secondly, there is also an interest for us in representational space and the use of visual scores. A clear example of this is the piece we produced earlier this year called Arcadia for the Sound of the Deer themed event at Falkland Palace – an event that also comprised music, song, food and talks on the local history of deer hunting and husbandry. 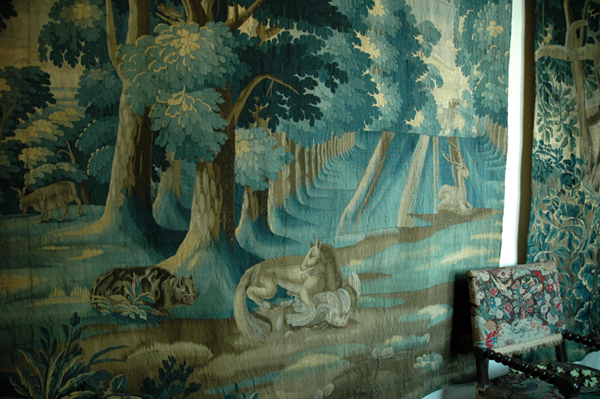 In the Palace is a 30 metre 17th Century Flemish tapestry containing images of an Arcadian landscape with a mix of native wild and domestic animals alongside more exotic fauna. This mix of animals also makes reference to another early use of the Palace, as the site of the King’s menagerie. This fantastical landscape also contains the exotically attired figures of courting couples and huntsmen on foot and on horse. We were interested to think about this process of, what Michel Chion terms, synchresis – the way we create a connection psychologically between what we see and what we hear – and attempted to create a soundtrack to accompany the tapestry, to give voice to some of the elements visualised in the tapestry. In keeping with the ethos of the Centre for Stewartship’s focus on local economies and cultures (for example, the ‘Fife diet’ where people attempt to subsist entirely on food sourced in the Kingdom), we decided that all these sounds would have to be sourced locally. This aspect seemed of particular interest to the audience, alerting them to places and activities of which they were unaware and surprising them with the audio diversity in the soundscape. So, to recreate the sounds we discovered a local menagerie, the archery club, a falconry centre and local farms, and even used some sounds on reel-to-reel from an old audio-visual presentation created in the1960s for the Scottish Deer Centre. We also worked with local singer Sheena Wellington, and recorded her singing an old Scottish ballad Johnnie o Brairdislie, which recounted the tale of a deer poacher and battles with the local stewards. The final piece was an 8–channel piece of 6 minutes duration on continuous loop with 8 speakers arranged along the length of the gallery as 4 stereo pairs. Consciously the sounds were recorded with conventional recording technology and mixed with minimal amount of processing – bar a local cat being pitch shifted to stand in for a lion we failed to source. As the event was in the evening, the guests were also handed torches so they could pick out the complex visual detail of the tapestry as they walked up and down the gallery. The emphasis of this piece was about providing a spatialised audio experience through a promenade along the gallery, the sounds triggering a more precise and focussed attention to the scenes and figures within the tapestry. Many regular users and workers in the palace said that the sounds had alerted them to details they had not previously noticed. The act of promenading along the tapestry is important given the placement of the speakers, which had their own stereo mix but were also mixed in relation to the other speakers. The piece was also individually ‘re-mixed’ in relation to the audience movements and position within the gallery – people choosing to linger or move on, or walk back and forth, to create their own personal version of the piece. ACF: The Estate mausoleum is one of the sites you are using. How might sound function at a site like this, with all its evocations of memory, relationship, status, class, sadness, inter-connection? DC & LKW: The mausoleum is an interesting space in many ways, particularly as it was designed as a ‘ruin’ during the First World War. We were wondering whether this was a deliberate mirroring of the ruins then being made on the Western Front, or a creative response to the availability of building material during wartime. We need to do some more research on the architect to find out these things. We have only just started thinking about this space, as we rather left it alone because it is still, and fairly recently, used as a family crypt. But we have now been given the go ahead to think about how we might consider this building, which is of great interest as a structure, and forms an echo of the now ruined temple on the hill above. As you say, the building already carries a whole range of emotional and historical weight, which you would not want to compete with or overwhelm with work. It might be that we just guide people there to experience the space or work with something fairly minimal. 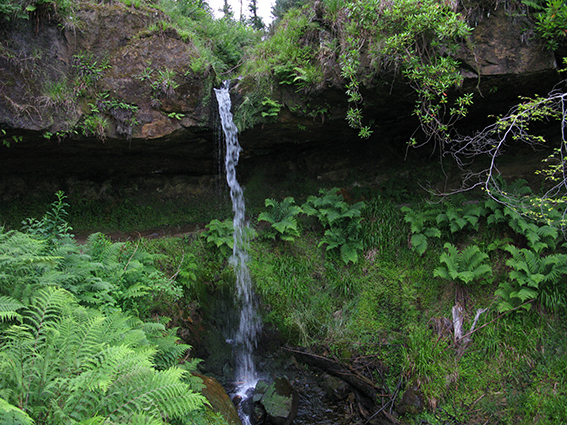 ACF: We walked past a stream in which a series of waterfalls had been constructed. Would you talk about that site and what kinds of meanings and emotions it creates for you? DC & LKW: The cascades were really the starting point for the project. 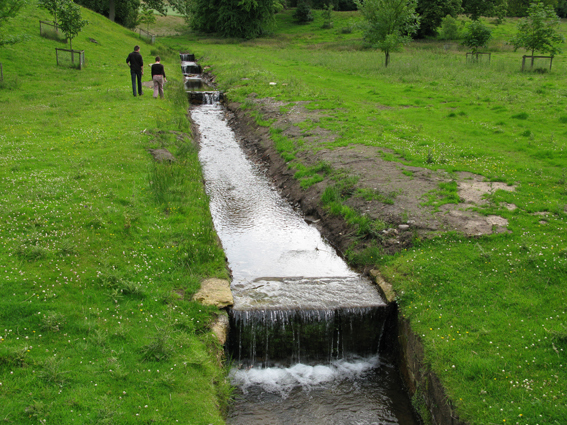 When we first heard about the estate it was suggested that these cascades might have been deliberately ‘tuned’. Although there is no firm evidence for this in any written record, this suggestion did raise our interest as a possible example of Victorian sound design. You can hear using your own ears that they each have a different tone, and some initial recordings made by Dr Damian Murphy indicate this quite clearly. 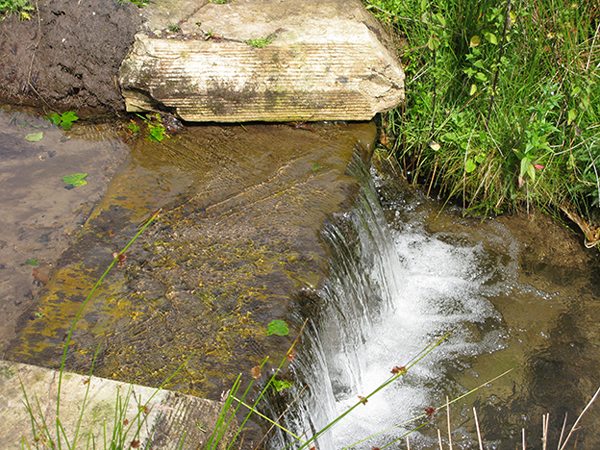 Whatever the truth, there are different workings apparent on the stonework of the cascades, which a modern stonemason recently suggests would have been made to alter the flow, and thus the sound. On a wider level we like the idea that these cascades were part of a pleasure walk that was designed to ‘delight the senses’ on a range of levels. 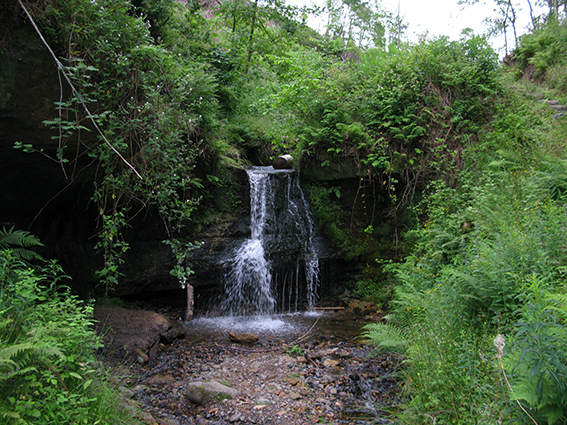 These cascades also make an interesting contrast to the natural, and much wilder, cascades and falls in the Maspie Den, on the other side of Falkland house. So, we can get a real sense of the gardens as a space where nature is tamed and managed, giving way to the wildness of the surrounding gorge and hillside. Also, reading some of the books on garden design from the early 19th Century, such as those by William Sawry Gilpin and Humphrey Repton, you see this activity was a serious business. Garden design was deeply influenced by a number of ideas then current in philosophy and responded to shifting aesthetic values in the visual and plastic arts. In addition, as these gardens were created under the auspices of wealthy individuals, their design was also a matter of a public display of taste and wealth and how taste articulated questions of class and social status. This is apparent in the building of the Falkland house by the Tyndall Bruces, who apparently unsure of their social status, commissioned a fashionable but restrained architect, William Burn, to design the house. The work was of high quality but in the mainstream of contemporary design. So it could successfully connote a modicum of worldly success but not draw attention to the owners as parvenus of some kind through a misplaced grandiosity. However, when the house was acquired by the 3rd Marquis of Bute, the interiors and exteriors were refashioned to his design. The Marquis was an extremely wealthy man and also a man of learning, a committed patron of the Arts and Crafts movement and a dedicated restorer of historic buildings. The interiors he commissioned are truly wonderful but bordering on, what we might consider today, high camp. The Marquis, who also created the more famous and ostentatious Mount Stuart House, sought to be a maker of taste, and was wealthy enough and sure enough of his own likes not to worry unduly about what others might think. ACF: Another great site at Falkland is the Tunnel. Would you talk about this as a sound space? DC & LKW: The Tunnel is a striking feature of the pleasure walk around the house and is, like most tunnels, a reverberant space that is very lively sonically. However, perhaps the most striking feature of the Tunnel, depending on the time of day and direction of light, is that as you walk through there is about a six-foot stretch on a corner where you cannot see ahead and you have to step into the dark. It’s been suggested that this was to give those passing through a deliberate frisson, a ‘sense of the sublime’ as they momentarily walked into the ‘abyss’. So, this is an interesting space given the sense of unease it might create. We are also thinking about this as an intimate space, a place where indiscretion might have occurred in the darkness – a stolen kiss, a squeezed hand. No doubt this is the result of an over exposure to Jane Austen’s novels, but we are thinking about working with binaural microphones here (which replicate the effect of human hearing), so people on our sound walk might experience whispered voices or other intimate sounds as they stop in the Tunnel. We are still considering what this might entail. 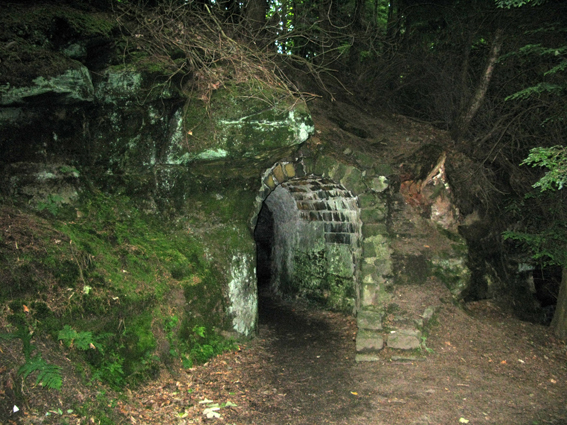 Again the Tunnel might be thought of as a transitional and symbolic space between the house’s formal surroundings and moving into the wilder region of the enclosed Maspie Den. 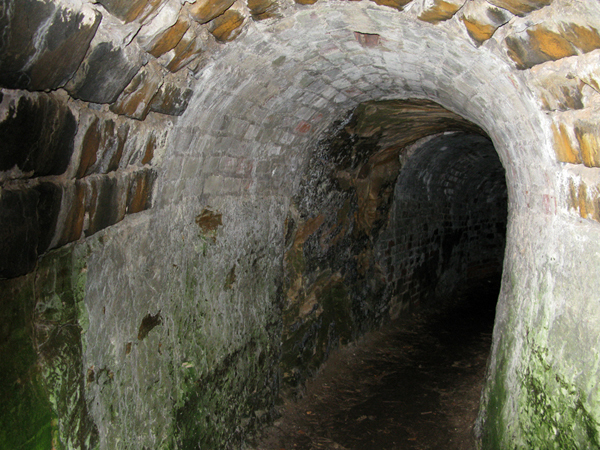 The Tunnel also modulates the sound of the burn that runs along below the tunnel. So, sonically you sense a shift as you move through and out of the Tunnel. ACF: I’m interested in the relationship between sound and touch – where touch is physical but also emotional, intellectual and spiritual. How does this relationship between touch and sound feature in your work? DC & LKW: The question of dividing any of the senses from each other, or exploring their interrelationship, is a problematic one. How you might deal with this theoretically is fraught with a number of difficulties and raises questions from a range of disciplines - philosophy, psychology, neurology and so on. The good thing about working as artists, as opposed to work we might do in a more academic context, is that we can play with the issues, invite questions, create experiences and not get too bogged down in the theoretical understandings of perception, although they obviously inform our work individually in a number of ways. There is a fair amount of sound-based work that deliberately explores the way sound can be experienced physically, as a more bodily experience. Work that might explore low-frequencies for example, given that these are most clearly experienced as a form of ‘touch’. However, you need to work through this question beyond just creating work that bombards the audience with heavy bass until their teeth rattle. One of things sound-based work does best is exploit the spatial characteristic of sound itself – especially via multi-channel speaker arrays or headphone-based soundwalks – which encourages wandering through a space, rather than experiencing a work from a fixed view-point. Wandering, while engaging in a soundwalk for example, means you will need to use some haptic sense – feeling the terrain underfoot, touching walls, steadying yourself on steep paths, brushing away branches and so on. The question of an emotional, intellectual or spiritual sense of touch is more difficult to evaluate, and must function on a more personal level. The emotional and intellectual experience in researching this place comes through the conversations, the archival research, walking the grounds, recording and documenting various aspects of the area. This does mean that you develop both an intellectual and emotional attachment to the place and the people you meet here, who share with you their own investigations and sense of attachment. We would want the finished work to communicate these emotional and intellectual experiences in some manner. In this regard the importance of a durational engagement with the site is important in building a relationship with both the place and the people here on a number of levels. ACF: Thank you both for your time and hope to hear more about the work you have planned for Autumn 2009!